Just wanted to say “thank you” to the local government of Montgomery County, Maryland. 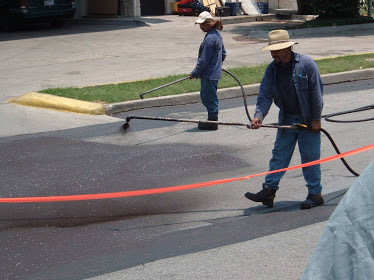 Not only did they pass a ban of coal tar pavement sealants last year, but in what may be the first in the US, they have made a Spanish translation of their English ban information flyer. Several reasons really. First many of the applicators are Spanish speakers and this information should get into their hands so they can be better informed. Just look at the picture bottom of this page below and you can see what I recall was an all Hispanic crew. Second many public and private organizations have seen the necessity of communicating their messages in both English and Spanish. The Department of Interior also has referred to the pollution caused by coal tar pavement sealants as an Environmental Justice issue for the poor of our communities. This stems from the fact that out of economic necessity these members of our community often fish in urban streams for food. Some areas of country limit the frequency of fish consumption because of contaminated sediment from chemicals included polycyclic aromatic hydrocarbons. Frequently this may be our immigrant population, many of which are native Spanish speakers. Pass it on and we hope other jurisdictions around the country follow suit!